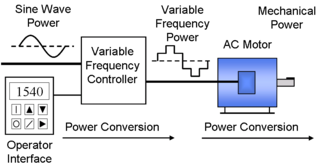 A variable speed drive (also known as a VSD, variable frequency drive, VFD, adjustable speed drive, inverter, converter or simply, ‘a drive’) is a device which is used to control the speed or torque generated by an electric motor. Its construction consists of a series of PCBs (printed circuit boards) to control the drive’s ‘power stage’, which receives and then feeds electrical current to the motor to control its speed and/or torque. These components are protected in a casing which can vary in its construction dependent on the environment in which the drive will be installed, and the drive can vary in its size dependent on the power it will receive required for the size of motor (or motors) it will control. Generally speaking, the larger the power required, the larger the motor and the larger the drive. The user can interact and program the variable frequency drive by using a keypad and screen attached on or near to the drive (also known as a Human Machine Interface, or HMI), or by a PC or laptop.